Gerald Maxwell Rivera (born May 23, 1973), also known by his stage name Maxwell, is an American singer-songwriter and record producer. 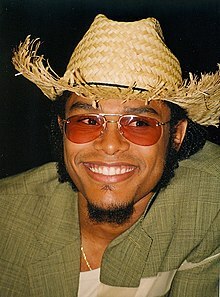 Along with fellow musicians D'Angelo and Erykah Badu, Maxwell has been credited with helping to shape what has been termed the "neo soul" movement that rose to prominence during the late 1990s. Maxwell was born in Brooklyn, New York, the son of a Haitian mother and a Puerto Rican father. His mother grew up in a devout Baptist household in Haiti. Maxwell's father died in a plane crash when Maxwell was three years old. The song was co-written by Leon Ware and is about a man's affection for a woman. ^ Ani, Ivie. "Maxwell Talks Social Media, Making Politically Charged Music & What the Legacy of 'Embrya' is 20 Years Later [Interview]". okayplayer.com. Okayplayer. Retrieved January 1, 2019. ^ Kwanteng-Clark, Danielle. "Good God: Maxwell And That Voice Popped Up At A Brooklyn Church For Easter". essence.com. Essence Communications, Inc. Retrieved January 1, 2019. ^ "Singer Maxwell talks tour, album and a baby, maybe". miamiherald.com. Miami Herald. Retrieved January 1, 2019. ^ "Maxwell - Artist". grammy.com. Recording Academy. Retrieved January 1, 2019. ^ On the Cover: Maxwell – Let Me Love You (Giant Magazine) Archived August 24, 2009, at the Wayback Machine. Thelatestmaxwellnews.com. Retrieved March 2, 2012. ^ a b c d e Adams (1998), pp. 172–173. ^ a b Williams, Jean A. "Maxwell Finds His Groove[dead link]". Milwaukee Journal Sentinel: July 23, 1997. ^ [dead link] Maxwell Unplugged CD Archived October 13, 2008, at the Wayback Machine entertainment.circuitcity.com. ^ "American album certifications – Maxwell – Embrya". Recording Industry Association of America. If necessary, click Advanced, then click Format, then select Album, then click SEARCH. Archived from the original on July 17, 2013. Retrieved July 16, 2013. ^ "The Billboard Hot 100 - Maxwell - This Woman's Work - Chart Listing For The Week Of jun 29 2002". Retrieved February 15, 2009. ^ "The Billboard Hot R&B/Hip-Hop Songs - Maxwell - This Woman's Work - Chart Listing For The Week Of jul 06 2002". Retrieved February 15, 2009. ^ Cinquemani, Sal. Review: Now Archived February 22, 2014, at the Wayback Machine. Slant Magazine. Retrieved on 2009-09-25. ^ "Video Maxwell's tribute to Al Green, BET Awards 2008 van That Marcus – Myspace Video"[permanent dead link]. Vids.myspace.com. Retrieved March 2, 2012. ^ "Maxwell Shocks, Awes and Delights at BET Awards" Archived September 12, 2013, at the Wayback Machine. Soulbounce.Com. Retrieved March 2, 2012. ^ MAXWELL [@_MAXWELL_] (December 18, 2014). "'BLACK_S. U. M. M. E. R. S'_NIGHT' #WINTER2015" (Tweet) – via Twitter. ^ "Maxwell Performs 'Lake by the Ocean'". YouTube. Retrieved May 5, 2016. ^ Nelson, Trevor. Radio 1 Listeners Top 50 Albums of 1993-2003 Archived July 17, 2011, at the Wayback Machine. TrevorNelson. Retrieved on 2009-03-30. ^ Reynolds, J.R. (February 3, 1996). "The R&B Business has a single problem; Record companies celebrate Black History". Billboard. Billboard Music Group. 108 (5): 31. ISSN 0006-2510. Retrieved July 28, 2016.